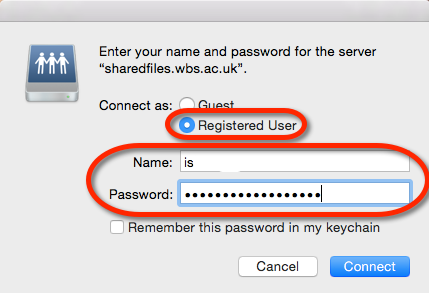 Step 4: Login with your WBS username (i.e. *not* the one starting bs... or u1xxx) and password then select Connect - only select Remember this password in my keychain when you are confident you have the correct details. Step 5: A window will open showing you the Shared folder, when you expand this you will see all of the shared folders to which you have access.